Now that I’ve resumed more or less regular posting, I can keep a longstanding promise. A few years ago I wrote about Greenbelt, the annual Christian music festival, its obsession with the situation in Gaza, and what I saw as its worryingly one-sided representation of that issue. In the course of the debate that followed in the 'comments', I undertook to write something that would try to explain the increasing hostility to Israel among some Christian groups. I felt I was in a good position to do this, both because of my own Christian background, and because I used to be fairly pro-Palestinian and anti-Israel myself. This is the first post in a two-part series in which I'll try to fulfil that commitment. In the period since I wrote that post, attitudes have, if anything, hardened, with anti-Israel campaigning migrating from fringe groups to the mainstream churches. A recent example of this was the Methodist Church seriously debating whether to boycott Israeli goods and institutions – something that particularly aggrieved me, as someone brought up in the Methodist tradition but who is also a critical friend and supporter of Israel. The cover image promoted a major story inside the magazine by Elena Curti, describing the sufferings of Palestinians in Gaza and the West Bank. Taken together, it seems to me that the image and the story exemplify many of the key components of recent Christian attitudes to the issue of Israel/Palestine. Let’s start with that photo, which is typical of a certain kind of pro-Palestinian iconography. The whole complicated and intractable conflict is reduced to, and symbolised by, two figures: Israel is represented by an armed soldier, the Palestinians by a young child. Not only that, but the child is foregrounded and looking at the camera, as if making a direct appeal to the reader, while the soldier is lurking in the background, hand-in-pocket, nonchalant and impersonal. It’s pretty clear what this is supposed to tell us: the Israelis are the aggressors, while Palestinians are simply innocent victims. It’s not that the image is necessarily ‘untrue’, but it’s obviously partial and selective. Think, for example, of the very different meanings that might have been conveyed by a photograph of Israeli children cowering under school desks during a Palestinian rocket attack. Or imagine if, at the height of the Troubles in Northern Ireland, a magazine had carried a picture on its cover of a Catholic child walking past a British soldier. Readers might justifiably have felt that the image represented a simplistic and one-sided view of the conflict, sidelining IRA atrocities and the reasons why British soldiers were present in the first place. Similarly, my problem with Curti’s article in The Tablet is not that what she writes - about the everyday sufferings of Palestinians as a result of the separation fence and the occupation - is necessarily a lie. I’m not qualified to dispute the substance of the piece, and indeed that’s not really the point of this post. But there are a number of things that are remarkable about the article, and I think they are typical of much recent Christian coverage of the issue. 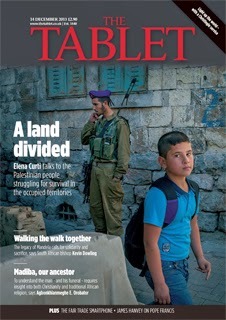 Firstly, there's an exclusive focus on the sufferings of the Palestinians. There's not a word about the sufferings inflicted on innocent Israelis by the aforementioned rocket attacks from Gaza, or by suicide bombers targeting restaurants and buses – the very actions that prompted the need for the security fence and the restrictions on goods entering Gaza in the first place. Nor is the mainstream Israeli point of view given any space in the article: the only Israelis whose voices get represented are a fringe group who oppose their government’s policy. Curti makes not the slightest attempt to provide a balanced perspective, or to put the suffering of Palestinians in any kind of wider context. You’ll search in vain here, not only for any reference to the ongoing campaign of aggression against Israel by Hamas, but also for any mention of the tons of supplies allowed into Gaza by Israel every day, or to the blockade of Gaza by its other neighbour, Egypt, or indeed to the sufferings inflicted on ordinary Palestinians by the increasingly authoritarian regime of Hamas. And then there’s the underlying question: why choose to put Gaza on the front cover and make it your lead story at this particular time? I suppose one explanation is that Christians have an understandable interest in the Holy Land, especially at this time of year, and stories that try to find parallels between the Nativity story and the current situation there have become a staple of Christmas coverage – often, it has to be said, with a simplistic anti-Israel inflection. The more immediate pretext for the Tablet story is that Gaza is the focus of this year’s Christmas campaign by Christian Aid. If you follow the link to the charity's website, you’ll find further evidence of Christian obsession with the issue, and yet more one-sided treatment of it. On the day that I read this article in The Tablet, the television news was dominated by images of the desperate plight of Syrian refugees in Lebanon, as winter temperatures begin to plummet. One wonders why this urgent issue, or the continuing need of the victims of the floods in the Philippines, or any of the other myriad and more pressing needs around the world, are not the concern of Christian Aid this Christmas – rather than yet another campaign focused on Gaza, in which a complex conflict is reduced to a cartoon in which Israel is the only bad guy? How are we to explain this current Christian obsession with Israel/Palestine, often to the exclusion of other more urgent issues? I’ve already suggested one reason – the natural concern of Christians with the land which gave birth to their faith – but this hardly accounts for the increasingly partial and one-sided attitude to the issue shown by Christian churches, charities and campaigning organisations. In the next post, I’ll share my personal analysis of the reasons for this emerging Christian anti-Zionism. 1. The barrier does not consist of “electrified wire fences of the kind used to confine animals”. Those used to confine animals give those who touch them a shock. The barrier does not give those who touch it a shock. It sends an alert to the IDF letting them know where the fence has been touched. 2. Their effect is not “to confine the Palestinians to ever-shrinking portions of land”. The number of legal (by Israeli law) settlements in the West Bank has actually declined this century and new housing has been within existing settlements. Israel has repeatedly taken action against illegal outposts. New Jewish settlements are not created or existing ones enlarged. New housing for settlers has been within existing settlements, although there has been a lot of such new housing. 3. The highways are not totally barred to Palestinians. There are some highways which, for valid security reasons, Palestinians need permits to use. Many, for example those who work in settlements, have such permits. 4. In areas A and B where 96% of the Palestinians live planning permits are a matter for the Palestine Authority. In Area C, which the Palestinians agreed was under Israeli civilian control, only the homes of those involved in acts of terrorism or aiding such acts, and houses built without planning permission, usually on land they did not own, have been demolished. Most such houses built without planning permission have not been demolished. Israel has been at least as tough on Israeli housing built without planning permission. The International Court of Justice advised that Israel settlements in the West Bank are illegal. It did not advise that Israel's occupation of the West Bank is illegal; in fact its advice was premised on the basis that the occupation is illegal.